Using a top-notch concealer is key to achieving a flawless appearing makeup application. The best concealers cover discolorations, lighten dark areas, disguise blemishes, and work in tandem with your foundation to achieve the appearance of an even skin tone. On the other hand, a poorly formulated or improperly applied concealer can draw attention to problem areas, make blemishes look more obvious, and create a white cast around dark areas, especially under the eye. The key is knowing which type of concealer you need and how to apply it. Choose your concealer based on what works for your skin type and concerns. If you have dry skin, don't go for a liquid concealer with a matte finish because the finish will emphasize dryness. If you have oily skin with enlarged pores, don't go for a creamy or stick concealer as these textures tend to clog and magnify the appearance of pores, plus they tend to add an oily shine. We know this sounds basic but it is surprising how often the wrong concealer gets used. For creating a more even finish over minor skin discolorations, a light to medium coverage concealer will do the trick. For the undereye area, be sure to select a shade of concealer that's no more than one or two shades lighter than your natural skin tone to avoid an obvious white circle around the eye area. For your face, select a concealer that matches the color of your foundation exactly. Avoid concealer shades that are noticeably pink, rose, peach, white, yellow, or copper as they will show through your foundation, creating an unnatural appearance. Following the above guidelines, you can begin to experiment to find the textures, finishes, and application techniques that work best for you. Of course, it never hurts to have a makeup artist show you application tools and techniques and you can adapt those techniques to your advantage. Liquid concealer is the most versatile type of concealer because it offers buildable coverage and works for all skin types except very dry. This type of concealer is also easy to apply. Liquid concealer is preferred for covering pimples because it is the least likely to cake up and it poses minimal to no risk of clogging pores, which a creamier concealer may do. It’s also desirable for use on wrinkled areas because its thin texture makes it the least likely to crease throughout the day, although some slippage into lines is always possible. Liquid concealers with a matte finish last longer than those with a satin finish; they are also less likely to migrate throughout the day. Satin-finish liquid concealer has more movement, but it can provide a more natural look, especially over dry areas. A liquid concealer with a radiant shimmer finish is good for under the eyes because it covers and highlights the area with a soft glow, but it should be only a subtle glow, not overt, sparkling shine. Stick concealer is aptly named because it has a semi-solid texture, is often richly pigmented, and has a thick, creamy texture. This type of concealer can be dotted on or swiped on in a line of color and then blended. Blend the product in a stippling motion with a clean finger or with a small concealer brush, feathering the edges into surrounding skin. It’s important to note the ingredients that keep these concealers in stick form pose a high risk of clogging pores, making it a less-than-ideal option for those with oily or combination skin. Generally, cream concealer provides medium to full coverage. This type of concealer is usually packaged in a small pot, palette, or compact. Cream concealer works well under the eyes and is one of the best concealer options for covering discolorations. Cream concealers have more slip and can be applied in a stippling motion with a clean finger, sponge, or a small concealer brush. However, those with a notably more creamy finish are more prone to creasing into lines and wrinkles and should be set with loose or pressed powder once blended. 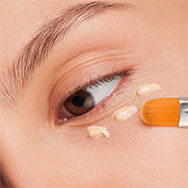 Regardless of the type of concealer you're using, the application techniques generally remain the same. For almost any skin type, it is important to prep your face and eye area with a light layer of moisturizer (don’t go too emollient or everything will slip and slide off your face). If you have normal to oily skin, a lightweight liquid or fluid moisturizer with a soft matte finish will give you the best results. Some people find it best to apply concealer and then their foundation, while others find just the opposite achieves optimal results. Except for powder foundation, this is a personal decision as there is no absolute right way. Dab the concealer onto discolorations, dark areas, or skin imperfections with a clean finger, brush, or sponge and gently blend out until there are no apparent lines of demarcation between the concealer and your skin or foundation. Liquid, cream, or cream-to-powder concealers should not be applied over powder foundation as they can get clumpy and look mottled. If you use powder foundation, apply concealer first, allow it to set, and then apply your foundation. Finish by setting the concealer with a light dusting of loose or pressed powder. A concealer with a matte finish doesn't need to be set with powder because that may make it look or feel too dry, but you can experiment and see how your matte-finish concealer looks and lasts with and without powder. When applying concealer to the undereye area, try using one with a radiant finish or adding a luminescent highlighter on top of it for a light-reflective finish that further disguises shadowed areas. Armed with this information, you’re now ready to choose and use the concealer that works best for you!